PokerStars is the largest online poker room in the world, is home to exciting features such loyalty rewards, mega tournaments, and great bonuses. Don’t forget to use your PokerStars Bonus Code to recieve your welcome bonusThe hottest features of PokerStars are Team PokerStars comprising some of the best professional poker players in the world, Poker Blog with interesting poker articles, PokerStars TV, and Poker School for beginners. It offers non-stop poker tournament action and a huge collection of cash games for fun/real money. PokerStars is the home of the Sunday Million, the largest weekly online poker tournament in the industry, and the European Poker Tour (EPT), a lucrative annual event. It is also a great place for poker players to qualify for prestigious live poker events such as the PokerStars Caribbean Adventure and the World Championship of Online Poker and PokerStars is licensed and regulated in the Isle of Man. PokerStars welcomes new players with a 100 percent cash match bonus of up to $600 on their initial deposits, giving players a chance to fatten their poker bankrolls. Besides, PokerStars offers reload bonuses throughout the year and players need to login regularly to their PokerStars account to grab these reload bonuses. PokerStars used to offer a very small bonus of only $50 back in the past. But fortunately things have changed now and the moment you sign up for the first time you can take advantage of a bonus that can go up to $600 at 100% match up rate. This bonus is given for the first 3 deposits that you make during the first 90 days as a player. 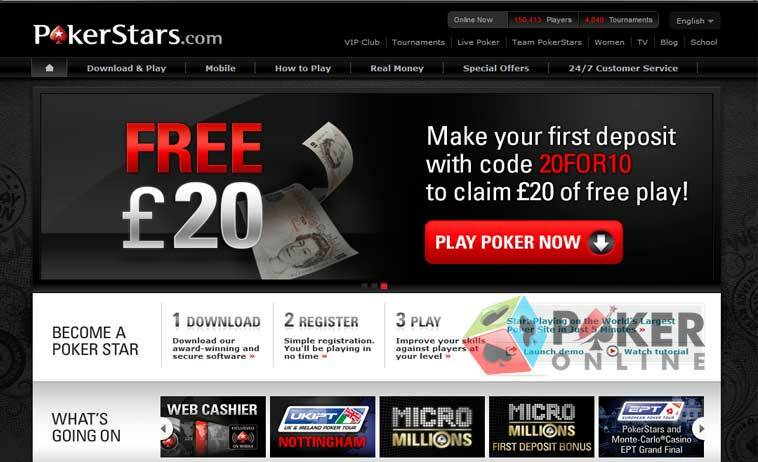 After that you will have 6 months available to earn the VPPs and have the bonus released into your PokerStars account. The bonus is released in $10 increments every time you earn 170 VPPs. From time to time, PokerStars is also giving out some reload bonuses for the players that are already members of this poker room. Make sure that you keep an eye on the promotional e-mails that you get from PokerStars, since usually that’s where they promote their bonuses. To get started, players only have to download the poker gaming software, which is both Mac poker and Windows compatible. The online poker room offers a rich portfolio of online poker variants such as Razz, Texas Hold’em, HORSE, 8-Game, Badugi, Omaha, Stud and others. One of the biggest reasons why PokerStars is a great online poker venue for beginners is that it offers games for free. In fact, PokerStars has more free money tables than any other online poker room in the industry. All players need to do is register, download the poker gaming software, and search for the Play Money tables. If players are ready to play for real money, the blinds start from as low as $0.01/$0.01 and go as high as $1000/$2000, making PokerStars a great online poker room for beginners, recreational players, learners, seasoned players, as well as professional players. Moreover, PokerStars runs on highly sophisticated software, which allows players to customize their gaming experience by choosing different themes, card designs, avatars, table size, table position, sound effects, and animations. Besides, players can avail of facilities to maintain notes on their opponents’ gaming style, chat with poker buddies, request stats and history, and so on. The software also allows players to play in multiple time zones, currencies, and languages. PokerStars is make continuous attempts to make its software better than ever, owing to which players are free to send their feedback to ideas@pokerstars.com. PokerStars is home to some of the largest online poker tournaments in the industry and has qualifiers to world renowned tourneys. You can find qualifiers to the World Series of Poker (WSOP), the APPT or Asia Pacific Poker Tour, the European Poker Tour (EPT) and the Latin American Poker Tour (LPT). You can also try playing the regular poker events like the Sunday Million or the World Championship of Online Poker. There is also the Spring Championship of Online Poker to take into consideration. PokerStars Women : One of the most exciting things about PokerStars is the way it pampers its women players, giving them the opportunity to participate in the PokerStars Women Live, an event held at the world’s best locations. Women players can travel, meet poker buddies, and play poker against talented professional poker players. PokerStars also contains a separate section called PokerStars Women, where they can get the latest news and updates regarding PokerStars events and promotions meant for women only. It’s not a surprising fact that PokerStars currently holds one of the highest amounts of poker tournaments. Every day you get to find No Limit Texas Hold’em tournaments with buy ins that start from as little as $1 and go up to a couple of hundreds of dollars. There the guaranteed prizes at these tournaments range between $2k and go up to $80k. However the largest tournament takes place on Sunday. It’s called the Sunday Million and has a grand prize of $1,000,000 guaranteed every week. You can either choose to use satellites to win your ticket to this tournament or pay the direct buy-in for $215. 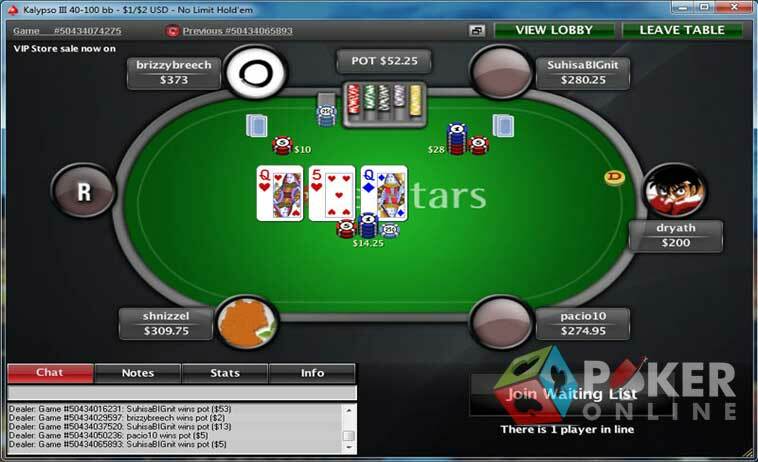 PokerStars has an excellent selection of Sit and Go poker tournaments. Once you are a member of this poker room you get to find SNG tournaments that will range from heads up to SNG tourneys that have up to 990 players. At the same time the buy ins at these tournaments start from as little as 1 or 2 cents and go up to a couple of thousands of dollars. There will be both single table and multi table Sit and Go tournaments. The SNG selection that you can find at PokerStars is probably one of the largest in the world. The traffic you can find at any hour of the day is simply insane. In addition to all the regular games that you can normally find at a poker room, there are tons of special SNG tournaments like: Double or Nothing, or Steps. The online poker software and the graphics are just two more areas in which this poker room manages to excel. Even if the number of players during the peak hours reaches hundreds of thousands, everything still runs smoothly and bugs free. The software has always been great and managed to offer a great poker experience. There are tons of customization options available so that you can create the poker tables the way you want to. The windows are resizable and they can be easily fitted on your screen to play at more than one table at the same time. In addition to that there are also tons of unique features available that can’t be found anywhere else. The game variation available at PokerStars is definitely another strong point of this poker room. The moment you find yourself in the lobby of PokerStars you get the chance to notice that there are all the classic poker variations along with the draw and mixed games plus some exotic poker games that are less known to the public. The great thing about the PokerStars games is that you get to find plenty of players at all the games. This is happening thanks to the fact that the number of players is very high. The number of players that you can find at PokerStars is still incredibly high. They are right now the largest online poker room on the planet and they keep on growing every day thanks to a worldwide marketing advertising campaign. The online statistics are showing that during the peak hours you can find up to 20,000 players at the ring games and the tournaments hold up to 150,000 players. This means that you are about to find enough tables and tournaments at any hour of the day and night. The competition is definitely one of the aspects of PokerStars that you should take into consideration before signing up. The moment you get to the higher limits the competition is going to get tough. In case you compare PokerStars with the industry average, here you are about to find some tighter games. At the same time there are also many new players signing up every day and this makes sure that at least at the low buy ins tournaments and the micro and low stakes ring games there is still hope for a soft competition full of fish. There are always a very large number of poker tables and tournaments available and this means that you get the chance to always find a large variety of players. While there is currently no rakeback deal available for PokerStars, you can still get a part of the rake paid back to your account with the help of the VIP loyalty program. This loyalty program can offer you a rakeback from 5% and up to 32%, based on what level you manage to reach. New poker players automatically become members of the PokerStars VIP Club right from the moment of registration. This is a point-based system, which rewards players with Frequent Player Points (FPP) for real money play. These points can later be exchanged for exciting items from the PokerStars VIP Store. The VIP Club comprises tiers and players will be assigned a tier on the basis of the number of points they collect. Each tier is associated with attractive bonuses, rewards, and incentives, including free tickets to PokerStars events and bonus FPPs. The highest loyalty level a player can achieve at PokerStars is the Supernova, which gives players full access to the PokerStars VIP store, larger FPP multipliers, free entries to quarterly VIP tournaments, milestone cash bonuses, and much more. There is an excellent loyalty program available for you at PokerStars. All the players are entitled to be part of the PokerStars VIP Rewards. All real money players will be part automatically of the loyalty program and they get to win exclusive rewards including cash back, merchandise from the VIP Store (Consumer electronics, apparel, books, travel) and tickets to the VIP Tournaments. In order to get rewarded you have to earn VIP Player Points and FPPs. There are six different VIP levels available and based on the total amount of VPP that you manage to earn in the previous months. The name of the VIP Levels are: BronzeStar, SilverStar, GoldStar, PlatinumStar, Supernova and Supernova Elite. The online poker community is treating with respect all the players that have managed to reach Supernova Elite or at least Supernova VIP level. Since PokerStars is the largest poker room in the world there will be plenty of payment methods available to make both deposits and withdrawals. You can always withdraw your winnings from PokerStars by using the following payment methods: Visa, Neteller, Skrill (also known as Moneybookers), ClickandBuy, WebMoney, check, couriered check, direct bank transfer. The withdrawals are processed fast. This means that people that are using ewallets and echeck will have to wait around 48 hours to have their transactions processed, while checks and bank wires take up to 7 days to process. PokerStars has an excellent 24/7 customer support system, which includes a comprehensive Frequently Asked Questions (FAQ) section. If players cannot find answers to their queries in the FAQ, they can use the online contact form or email their queries to support@pokerstars.com for a quick response. While there is no live chat or phone support available, you can still get an answer to any question or problem that you might have pretty quick. PokerStars’ customer support service is available 24/7 and since they have more than 12 years of experience, they have managed to come close to perfection. This means that the staff will always be fast, friendly and very knowledgeable at the same time. There is absolutely no question about the fact that PokerStars is the largest room in the world thanks to the fact that they manage to get close to perfection. One of the main reasons why PokerStars manages to stand out of the crowd is because they are currently the best place to play poker tournaments. You can find plenty of them with soft competition and some good prize structure. Even after taking the big hit in 2011 when they stopped accepting US players, PokerStars still manages to shine and be the number one poker room in the world.